Books that I have written or contributed to. Whether you are a novice or veteran, navigating the overwhelming amount of information about autism can be daunting. There is no shortage of books, articles, research, opinions, and misinformation. Autism spectrum disorder is one condition with common features that can manifest in diverse ways. 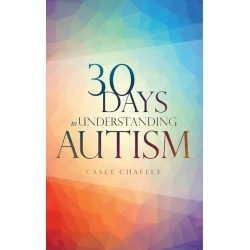 30 Days to Understanding Autism can be read all at once, used as a reference guide, or simply be a place to turn for daily information and support. The world is inundated with violence and headed for destruction. Following his desperate flight from the clutches of Havilah's wicked rulers, Noah finds himself caught in the middle of warring empires: the forces of Havilah, led by their evil king and priestess, battle the barbaric Nodite army for supremacy. Facing a decision that may cost loved ones their lives, Noah must find a way to escape the conflict to reach Emzara and fulfill God's calling. Seeking a safe place to build the Ark far from his enemy's reach, Noah leads his group to the last place he thinks anyone would look. Encountering numerous surprises along the way, he discovers that someone else has already planned for his arrival. As the Ark nears completion and judgment looms, Noah makes one more trek through a world dominated by deadly deceptions. 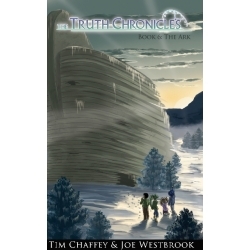 Aided by an unexpected stranger in a perilous place, Noah learns once again that the Creator always keeps His promises. 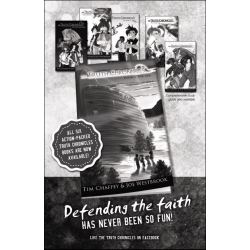 Adventure, wonder, and biblical history await readers on this riveting journey through the pre-Flood world, leading to an epic confrontation between the Creator's faithful preacher of righteousness and the serpent's priestess and her legions of darkness. 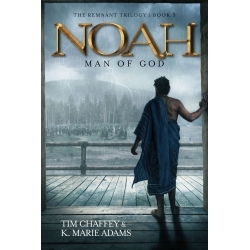 Noah: Man of God weaves together the storylines from the first two books and delivers an unforgettable conclusion to The Remnant Trilogy. Immerse Yourself in the Wonders of the Early Earth! Packed with action, adventure, and heartbreak, the second installment of the Remnant Trilogy continues the imaginative and respectful look at the life of this hero of the faith as God shapes him into the man who eventually saves humanity's future. As wickedness increases across the land, Noah and his loved ones endure the painful consequences of a world bent on evil. King Lamech expands his rule through deception and force, but does his kindness toward Noah hint that things may change? Noah and Emzara explore their world and their eyes are opened anew to the creative genius of the Most High, yet mankind's wretchedness threatens to upend their peaceful corner of the world. While tracking down the perpetrator of a malicious crime, they are tested by tragedy and must decide if they will sacrifice everything for truth and justice. After years of serving God, Noah reaches a crisis of faith due to his mounting frustrations with the proliferation of sin and the apparent silence from the Creator. 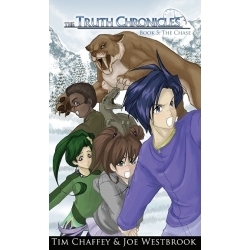 Thrust into a serious of perilous situations, Noah's deepest convictions are challenged. His response will direct his course and change the world forever. 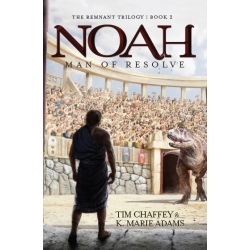 More than just a novel, Noah: Man of Resolve features non-fiction sections in the back of the book that provide answers to popular questions about the time in which Noah lived and explain where certain characters and events from the book can be seen at the Ark Encounter in Williamstown, Kentucky. 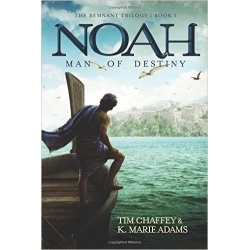 Noah: Man of Destiny takes readers on a captivating, coming-of-age journey. Noah learns about the Most High while standing against a sinister belief system emerging throughout the land. Whether escaping legendary beasts, tracking kidnappers, or pursuing his future wife, Noah acquires the skills he will need when God calls him to his greatest adventure: surviving the global Flood. Non-fiction portions in the back of the book help explain historical concepts and provide teaching sections that deal with issues and concerns that arise in the account. Gain fresh insights into the people and events of the pre-Flood world through the engaging, adventure-filled first novel of the Remnant Trilogy. Although Paul clearly spelled out the gospel for us, a major part of the message is frequently neglected by Christians. Yes, it is good news that Jesus died on the Cross for our sins and was buried, but that is not the end of the story. What happened three days later is what makes this event the good news. Jesus Christ conquered death when He rose from the dead. Do you proclaim the good news when sharing your faith? Every true Christian believes that Jesus Christ died on the Cross for their sins, was buried, and then rose from the dead. But can you defend these truths against the critical and skeptical attacks of our day? Are you prepared to show an unbelieving world that the foundation of the Christian faith is grounded in the historical reality of the crucified and risen Savior? Join Tim Chaffey and Eric Hovind for an engaging and exciting study of these world-changing events. Risen Without a Doubt dives into questions you haven’t even thought to ask. Tim and Eric take viewers on an unforgettable tour of the Lord’s betrayal, trials, beatings, execution, and victory over death. - Six one-hour DVDs, each divided into two sessions for a total of twelve 30-minute sessions. Without the Resurrection, there is no hope. We would still be in our sins, and the Christian faith could not exist. Jesus would be a fraud since He frequently predicted His own Resurrection, even designating it as His sign for an unbelieving world. Skeptics and critics understand the magnitude of the Resurrection, and they have developed numerous theories in their desperate attempts to explain away the wealth of evidence. The early Christians focused uniquely on Christ’s conquering of death. Yet many in the church today only discuss this vital doctrine at Easter time—and some fail to mention it entirely when attempting to share the gospel with unbelievers. Equip yourself to answer today’s skeptical challenges and strengthen your confidence in the risen Savior. 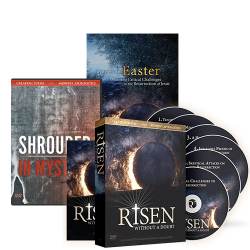 Discover why everything hinges on the Resurrection of Jesus Christ. Challenges to Jesus’ Resurrection are frequently made on the popular level, and answers must be forthcoming. 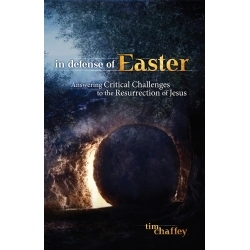 Tim Chaffey’s volume responds to many of these contemporary questions, as well as moving beyond arguments and evidences to the application of Resurrection truth. What difference can belief in the resurrection mean for believers today? This volume is an accessible handbook that covers a wide range of issues, both more theoretical as well as practical. I very much enjoyed my time with it, and recommend it to those who love this topic and are interested in material that is not readily available elsewhere. The Shroud of Turin features a faint image of a man that had been beaten, flogged, and crucified. Some believe this ancient linen is the burial cloth of Jesus Christ, while others flatly reject it, believing that the Bible and science rule it out. Yet no one can explain how the image was formed. Is the Shroud an elaborate hoax or could it actually be the burial cloth of Jesus? 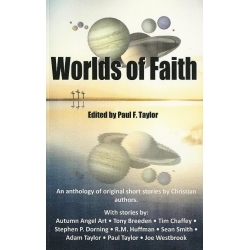 Worlds of Faith, edited by Paul F. Taylor, is a collection of short stories by Christian authors, mostly with a scifi or fantasy feel. Some of the included authors have had published novels. Others write non-fiction and are trying out fiction for the first time. Still others are completely new to publishing. We hope that you will enjoy this collection. Check out this 25-minute video where Tim Chaffey explains the centrality and importance of the Resurrection to the Christian faith, yet it is so often neglected by Christians while attempting to share the gospel.. 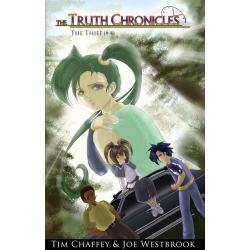 Pick up the entire set of The Truth Chronicles for one low price. This set includes all six novels, the short story, the study guide, and a link to download the teacher's guide to go with the study guide. 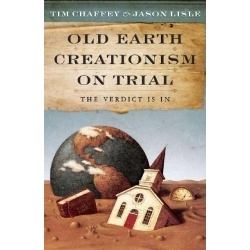 Tim's first book is a thorough, yet gentle and respectful critique of the old-earth creationists' arguments. The authors take a unique approach to this ongoing controversy and demonstrate that trustworthiness of God's word. The first section examines the arguments used by Christians who believe that God created over billions of years. The second section critiques the arguments used by those who claim that the Flood of Noah's day was merely a regional or local event rather than a worldwide catastrophic deluge as explained in Genesis. The final section deals with the philosophy of science. Dr. Jason Lisle demonstrates that true science will always support the Bible and that only a biblical understanding of the world provides the necessary foundation for doing science. Genesis 6 introduces two of the most mysterious groups in all of Scripture: the sons of God and the Nephilim (or giants). Scholars have been divided over this issue since the early days of the church. Were the sons of God really fallen angels that married women or were they something else? 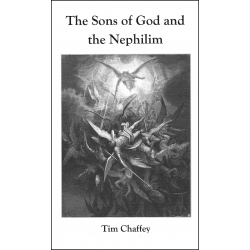 Were the Nephilim the offspring of the unions between the sons of God and women or were they already around prior to these marriages? Why were they on the earth again after the Flood? Find out the truth about two of the greatest mysteries in Scripture as Tim clears up the misconceptions and presents one of the most detailed and scholarly studies ever done on this subject. You may never look at the Old Testament the same way again. This booklet is the result of Tim's Th.M. thesis. It has been reformatted and a couple of sections have been added. What happens when a top secret project falls into the wrong hands? A new school year delivers more fun, adventure, and peril for the teens from Silicon Valley Prep. While facing challenges to their newfound faith from skeptics and believers, Jax and Izzy invent a way to make time travel safer. 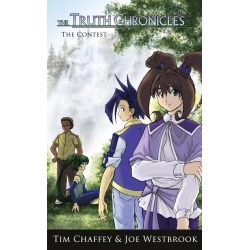 JT and Micky aim to repeat as science fair champions, but devastation strikes when someone with dangerous intentions takes an interest in their work. One mistake could bring consequences far greater than they ever imagined. How do you find someone who could be anywhere in time? 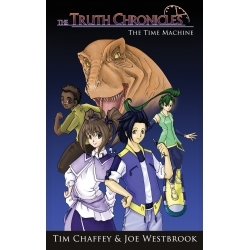 Jax and his friends race through the past to recover the stolen time machine. Unable to contact Micky, JT sets out with Jax and Izzy on a perilous trek bringing them face-to-face with dinosaurs, an abandoned village, and a ferocious saber-tooth. Will they be able to track down the thieves? After a shocking twist, the teens make one of the greatest discoveries of all. Would you risk your life for another? Noah's Ark! Exploring the discovery of a lifetime leads to both wonder and disaster for Jax and his friends. Jax and Izzy enlist the help of an expert to unlock the mysteries of an ancient letter. Because their project was destroyed, JT and Micky scramble to create a replacement in time for the science fair. A shocking revelation forces the teens to make their most difficult decision yet. Will they sacrifice everything to save a friend? Drawing on his own experience with leukemia, Tim offers practical advice for finding peace, hope, comfort, and understanding for those who have been, or have a loved one who has been diagnosed with cancer or other diseases. 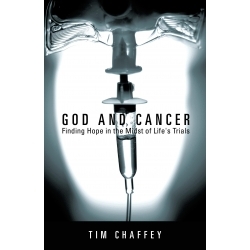 In addition to recounting his own battle with cancer, Tim ably demonstrates that the biblical solution to the problem of suffering and evil is the only legitimate one. This book will take the reader on a journey from the initial stages of cancer all the way through the treatment and provide the reader with the proper perspective for dealing with life's difficulties. Dr. Tommy Mitchell endorsed the book by writing, "Tim's experiences should be a wake-up call for the Church to recognize how important this issue is to our society at the present time." What Would You Do If You Could Travel Through Time? When four unsuspecting teens from the world's top science academy attempt a trip to ancient Egypt, they dive into an adventure beyond their wildest imaginations. Jax and Isaiah expect pyramids and pharaohs, but come face-to-face with some of the deadliest creatures to ever walk the earth. Can JT and Micky get there before it's too late? And what will happen when they are confronted with the true history of our world? How Far Would You Go To Discover The Truth? Explosions, raging rapids, and dinosaurs await as the adventure through time continues! While JT and Micky defend themselves against a mob of skeptics, Jax and Isaiah race to clear Dr. Thompson's name. Enlisting the aid of one of the world's top minds, the teens put their beliefs to the ultimate test. Can JT's faith survive the challenge? And how will the most important event in history change their lives? Defending the Faith Has Never Been So Fun! The pursuit for truth continues as the four teens from Silicon Valley Prep embark on another thrilling adventure through time. 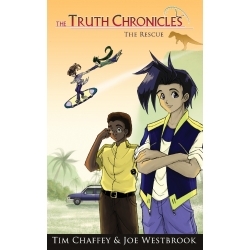 While searching for their friends, Isaiah and Micky save the lives of two children, victims of a brutal attack. Will their heroic act alter the future forever? For Jax and JT, finding a way home is more treacherous than anything they have ever encountered. Can their friendship survive Jax's quest for answers? Worldviews will be challenged and lives will be changed.